The hoilday homes are situated 2 miles from Glenelg village. 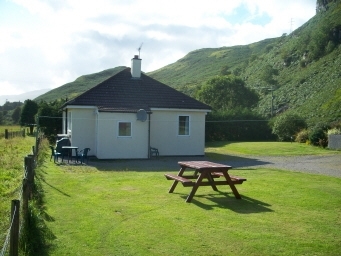 They are set in superb tranquil countryside under 2 miles from the coast and sandy beach. The ferry to the Isle of Skye is 4 miles from the cottage and is a 5 minute crossing and sails back and fore all day. There is an abundance of wildlife including golden eagles, buzzards and otters. The shell sand beaches and rocky coves of Sandaig Island are a short drive away. This is where Gavin Maxwell lived and wrote his books including 'Ring of Bright Water'. Several of the surrounding peaks exceed 3000ft. The area is rich in history. In earlier times the area was the site of a pictish settlement and the ruins of the 2 brochs are the best preserved examples of these structures on the Scottish mainland.